When thinking about these big meals, I realized that this site is lacking on side dish recipes. I can only attribute this to the fact that for me, vegetables are the star and rarely pushed to the side. (Of course, I do get the occasional comment about what I would consider a main meal being great as a side but not suitable for a main meal- to each is own.) However, with the holidays approaching, I know that not everyone is as excited about the vegetables as I am (I’m looking at you, dad.) 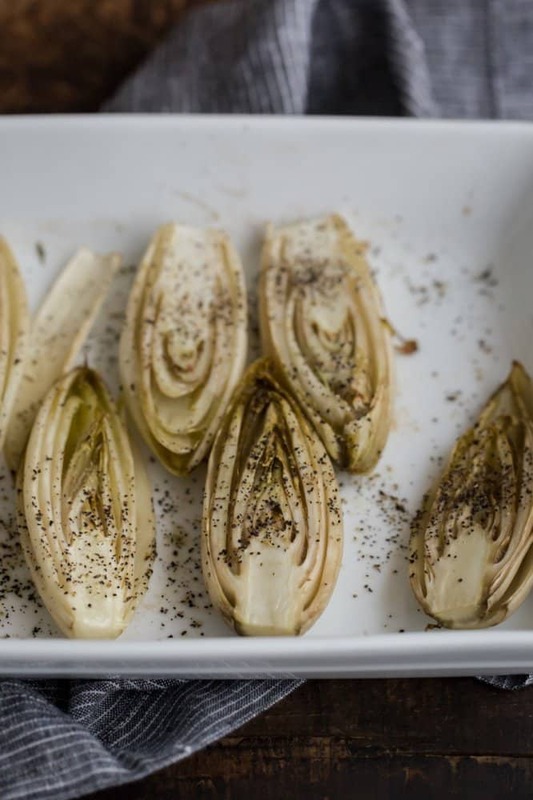 So I thought today I would share an easy, six ingredient (counting salt/pepper): Roasted Endives. 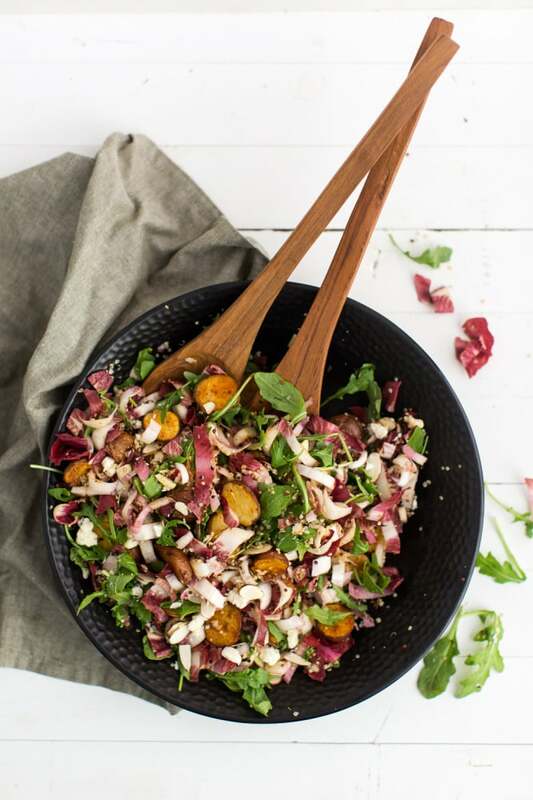 This is the type of side dish that makes your holiday meal just a little easier. Preheat oven to 425˚. 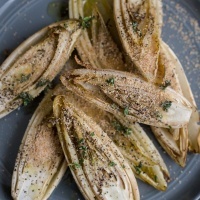 Slice the Endives in half lengthwise and toss with 2 teaspoons olive oil, salt and pepper. Place in a roasting pan and bake for 15-20 minutes until Endives are tender and starting to brown. Heat remaining 4 teaspoons olive oil in a small skillet until warm. 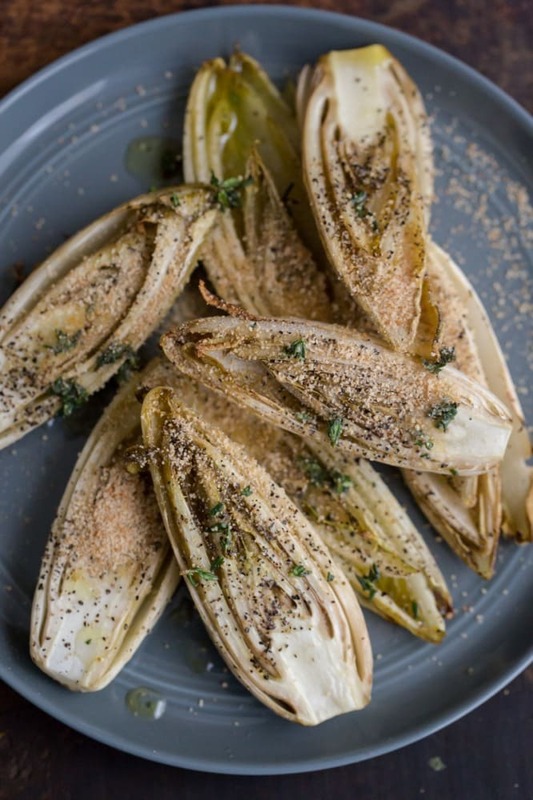 Remove from heat, add thyme and when endives are finished, drizzle the olive oil/thyme on top and sprinkle with toasted bread crumbs. Disclosure: This post was sponsored by California Endive. This looks like a wonderful addition to the Thanksgiving table. I’m also digging the sides-only Thanksgiving that you had last year. That’s genius! Low-key holidays are the best! We are doing a small vegan t-day with friends, and I couldn’t be happier. Low stress, low expenses, and plenty of board games and conversation! 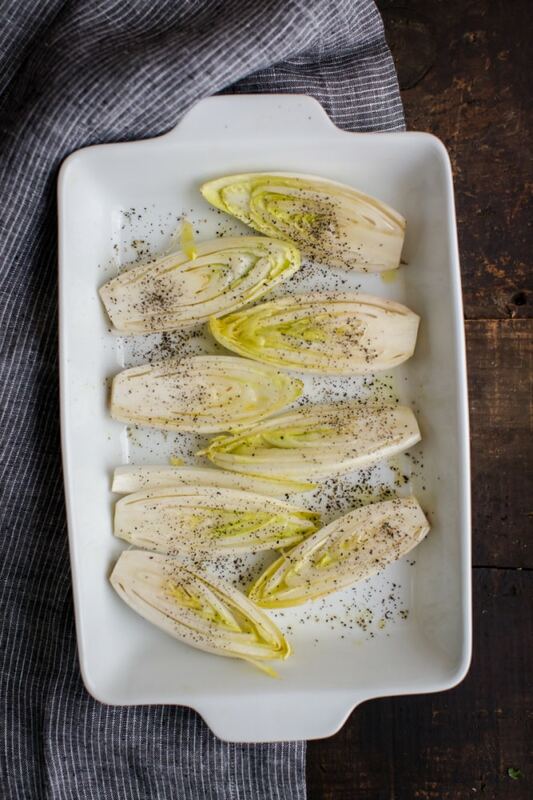 These roasted endives sound perfect for a fall feast — simple and delicious. mmmm this looks amazing. will now be on the lookout to see if my local grocery store carries endives! Love this. It’s simple, elegant and delicious. Definitely adding this to the holiday buffet table! When does the thyme get added? With the salt and pepper before roasting? Or mixed in the warm olive oil before being drizzled? Thanks!! Shoot! Must have gotten deleted but it’s fixed! Mix it in with the olive oil before drizzling! This will be a great addition to my Thanksgiving table! 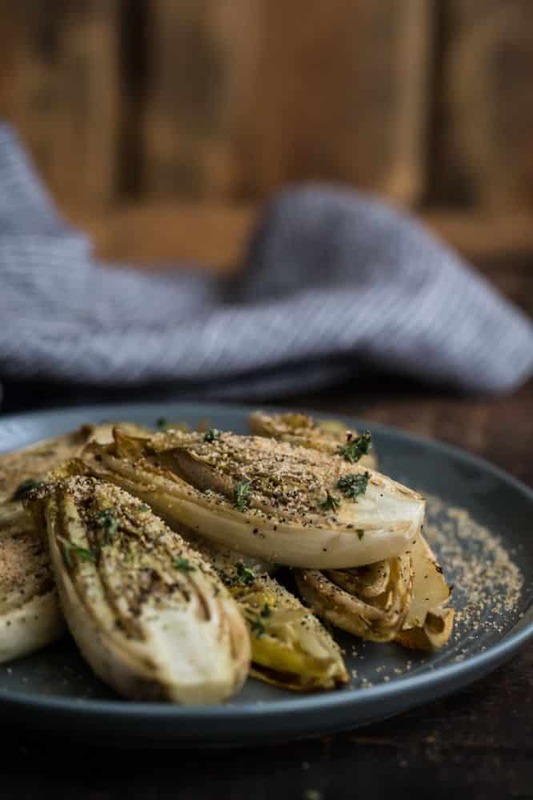 I love endive, and thyme is my favorite herb! 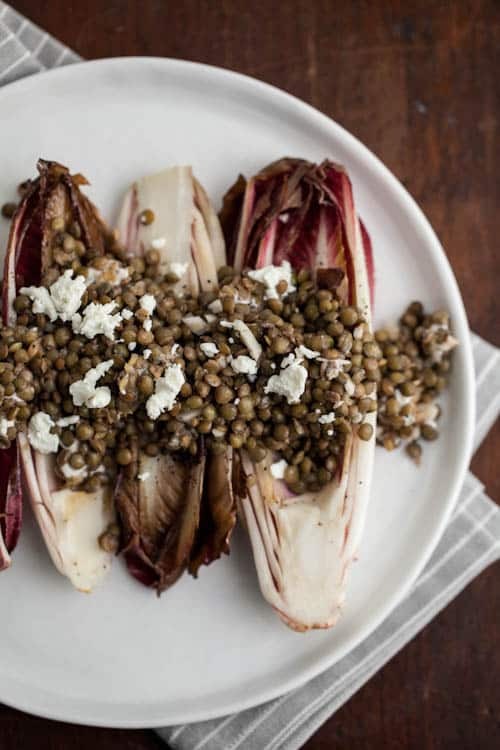 Roasting is the best way to cook endives! I also like adding some lemon afterwards. I love the simplicity here. And it’s something other than bread to pair with a dip this Thanksgiving! Thanks for the idea! I agree with leaves being the best scoops! I made mexican lettice taco thingys the other week! 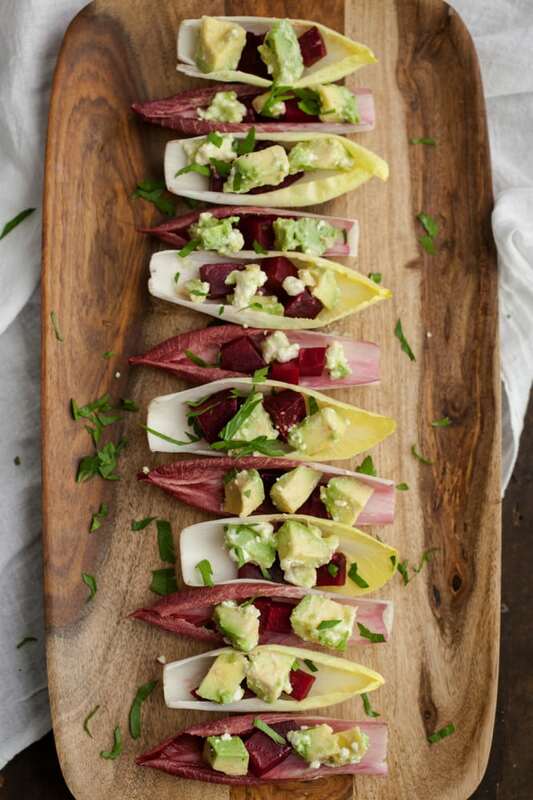 All your endive dishes looks amazing, I so want to jump into your kitchen!